This flowchart picture shows the evolution of water as it starts out in the Sun’s birth cloud, survives the destructive formation of the early solar system, and continues to exist to this day. We live in a solar system filled with water. Not only does liquid water cover 72% of our planet Earth, we have also found ice water in asteroids and comets, on the Moon, on Mars, and even in the shadows of craters on Mercury; while Europa and other moons of Jupiter and Saturn almost certainly harbor liquid oceans beneath their surfaces. A team led by graduate student Ilse Cleeves at the University of Michigan has determined that all other planetary systems should also have water just like our solar system by investigating how the solar system was able to produce all of the water that we see in the solar system today. Simply put, it could not. There is no way the solar system could have produced all of the regular water (H2O) in the solar system, because they cannot account for the production of all of the heavy water (D2O) that we see today in our oceans. Since the solar system could not have produced it, the majority of the water in our solar system – or at the very least, a decent amount – must have been left over from before the solar system formed. 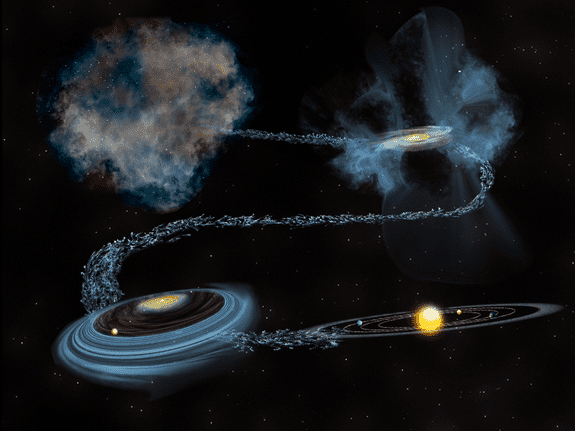 Astronomers have had two simple ideas to explain the origin of the solar system’s water. Either, our water is left over from where the Sun was born or the solar system was capable of producing that water by itself. (1) The Sun was born in a cold, giant molecular cloud. 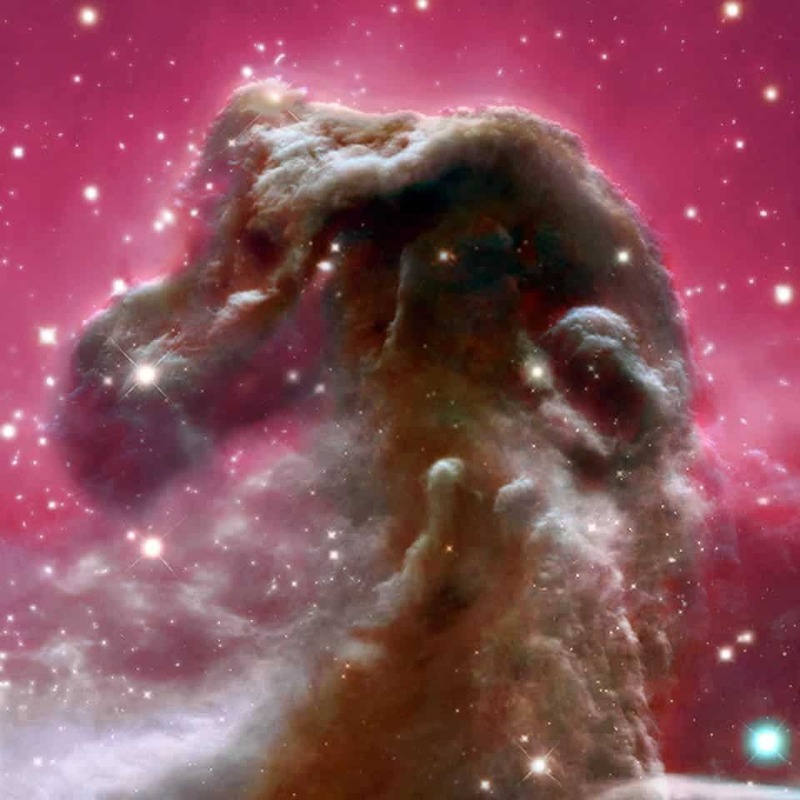 If you like astronomy pictures, you have probably seen some of these before, like the Horsehead Nebula shown above. These clouds have very rich chemistry, including water in the form of ice – very, very cold ice at temperatures of -263°C. It is possible that this water may have survived until today. (2) But, some have doubts that this water could have survived the formation of the solar system. The collapse of a cloud to form the Sun and the rest of the solar system is a very violent process that may have had the power to destroy most, if not all of the leftover cloud water. If this were true, the solar system would have to start all over and reproduce all of the water that the cloud once had. Ilse Cleeves and her collaborators thought they could test whether the second idea is even possible since they knew that heavy water (D2O) is difficult to produce. H2O and D2O are both made up of 2 hydrogen and 1 oxygen, but the hydrogen is a little different. All hydrogen atoms have 1 proton. The fundamental properties of all atoms are determined by the number of protons they have. But, hydrogen atoms in H2O do not have any neutrons, while the two hydrogen in D2O each have 1 neutron. To distinguish the two types – or, isotopes – of hydrogen, the isotope with one neutron is called deuterium and labeled ‘D’ instead of ‘H’. Though, really it is still ‘H’ – specifically isotope ‘2H’ instead of isotope ‘1H.’ An ‘H’ atom in a molecule can always be replaced by a ‘D’ atom, but the way that ‘D’-enriched molecule can chemically react will be different. As an aside, studying isotope ratios is a common tool in science. Both ‘H’ and ‘D’ are stable. But with other atoms that have unstable isotopes, you can take advantage of knowing how quickly the isotopes radioactively decay and use the isotope ratios to figure out the ages of objects made up of those isotopes. Where there is regular water (H2O), there is also heavy water (D2O). On Earth, roughly 1 in 6400 water molecules is not regular water, but heavy water. That is not a lot, but it is not zero either. In an 8 ounce glass of water, there are over 1024 water molecules. With 1 in 6400 of those being D2O, that is over 1020 D2O molecules – literally hundreds of billions of billions of heavy water molecules. (In general, Avagadro’s number – 6×1023 – is a good estimate of the number of molecules in most small objects you can hold in your hand.) That D2O had to come from somewhere. H2O is relatively easy to produce. Hydrogen is the most common element in the universe, while oxygen is rather common as well. Thus, it is no surprise that water in general is very common, even if it cannot always manifest in liquid form. There are multiple ways to create H2O in the realm of interstellar space. It has one way of forming in “warm” gas at temperatures above 220 Kelvin (-53°C). It has another way of forming in “cold” gas at temperatures below 220 K. However, D2O is not so simple to produce. Producing D2O requires 3 special conditions. (1) You need to have even “colder” gas at temperatures below 50 K (-223°C) since one of the intermediate reactions can only happen with a lot of input energy. (2) You need oxygen gas. That tends to be the easy one. (3) You need something energetic to strip electrons from molecules to make them ionized. Producing D2O in the Sun’s birth cloud is easy since you have all 3 conditions. (1) Clouds are very, very cold at 10 K (-263°C!!). (2) You have oxygen. (3) Annoying little, but high-energy nuclei known as “cosmic rays” that exist throughout space can easily ionize molecules. Unfortunately in the early solar system, the last condition – ionization – is not so simple. Now that you are in the solar system, the Sun does exist (unlike before) and the Sun has the power to deflect cosmic rays with the solar wind. 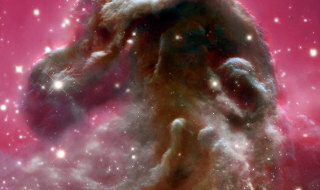 With fewer cosmic rays, fewer molecules will end up ionized. Even worse, the early solar system is much denser than our birth cloud. If you have more molecules, a smaller percentage, or ratio, of them will be ionized. That is bad since the ratio of D2O to H2O is what matters. Can you also produce D2O in the early solar system even with less ionization? Until this study, we did not know. This is the main question Ilse Cleeves and her collaborators wanted to answer. If the answer were to be ‘no,’ then at least some of the water would have had to come from the cold molecular cloud where the Sun was born. Cleeves and her team simulated all major sources of ionization in the early solar system to see if D2O could be produced without cosmic rays. The Sun existing interferes with cosmic ray ionization, but its own radiation can also help ionize molecules. In the end though, this is not enough to produce all of the D2O. Even the oxygen gas from condition number 2 isn’t always free to react in the denser early solar system. From these simulations, Cleeves and her collaborators determine that at least 7% of our ocean water and at least 14% of comet water originated from the Sun’s birth cloud. Those numbers are a significant percentage, but they are conservative. Less conservative numbers suggest that up to 50% of ocean water and 100% of comet water is from our Sun’s birth cloud, originating before the solar system formed. Planetary systems can be very different from each other. If our solar system were responsible for creating all of our water, then we may have been lucky that the right conditions occurred. However, star-forming clouds are very similar. As far as we know, there is nothing special about our Sun’s birth cloud and its chemical composition or conditions. Thus, if our birth cloud could produce a solar system with water, so could all of the other birth clouds that produced each of the thousands of planetary systems that we have already discovered as well as the ones that we have yet to discover. There are many reasons why other planets in other solar systems may not have life, but a lack of water in the system should not be one of them.